Turner Classic Movies celebrates its 20th Anniversary this month! And the April TCM schedule is absolutely wonderful. April also features a 90th Anniversary salute to MGM, with 21 movies from April 17th to 18th, and a big 12-film tribute on Doris Day's 90th birthday, Thursday, April 3rd. Another important note is that the TCM Classic Film Festival will be underway from April 10th to 13th, so be sure to check the TCM channel regularly throughout that weekend for interviews and introductions filmed at the festival. 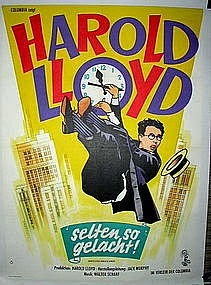 ...April Fool's Day gets underway with Harold Lloyd's classic SAFETY LAST! (1923). This witty film really delighted me when I finally caught up with it last year. A great start to a great month. 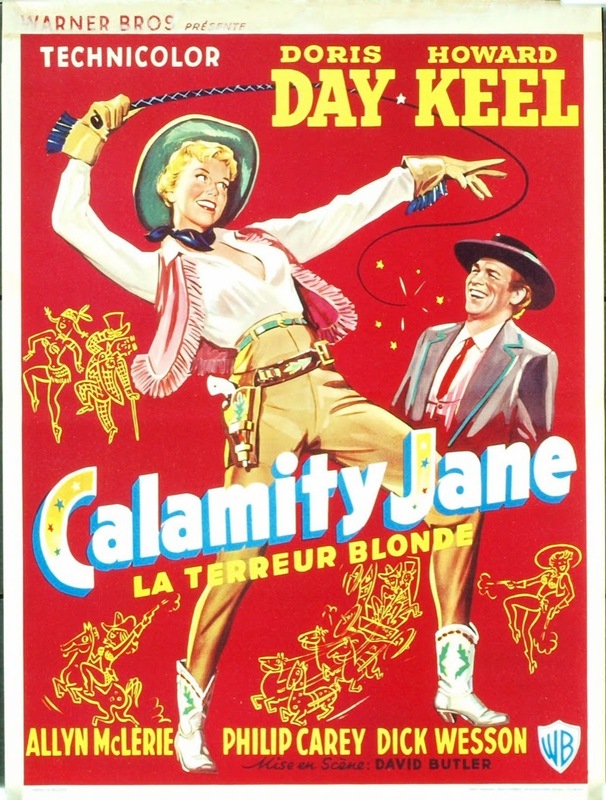 ...Doris Day turns 90 on April 3rd, and TCM has scheduled a grand tribute which includes one of her very best musicals, CALAMITY JANE (1953), costarring Howard Keel. 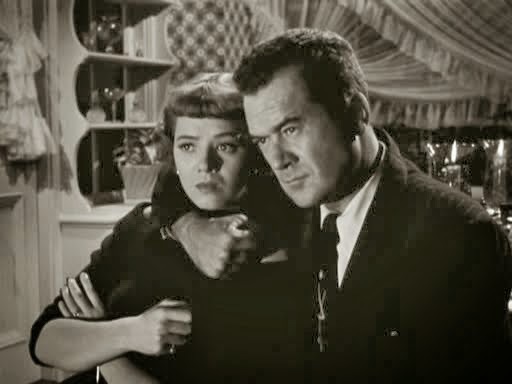 One of my favorite Day comedies, THE THRILL OF IT ALL (1963) with James Garner, also airs that date. Who can forget the swimming pool scene?! ...When watching Douglas Fairbanks Jr. and Nancy Carroll in SCARLET DAWN (1932), it's interesting to contemplate it was filmed a mere 15 years after the Russian Revolution, when the events were still fresh in the minds of the filmmakers. It's also a timely look back for modern audiences, given recent events. The air date is April 4th. ...A U.S. postage stamp honoring Charlton Heston will be unveiled at the TCM Classic Film Festival on Friday, April 11th. One week previously, on the evening of April 4th, TCM will feature a tribute to Charlton Heston, including SKYJACKED (1972), which may not be great art but is great entertainment! ...MARRIED BACHELOR (1941) has been on my viewing wish list for some time, and I'm delighted it's turned up on the TCM schedule for April 5th. 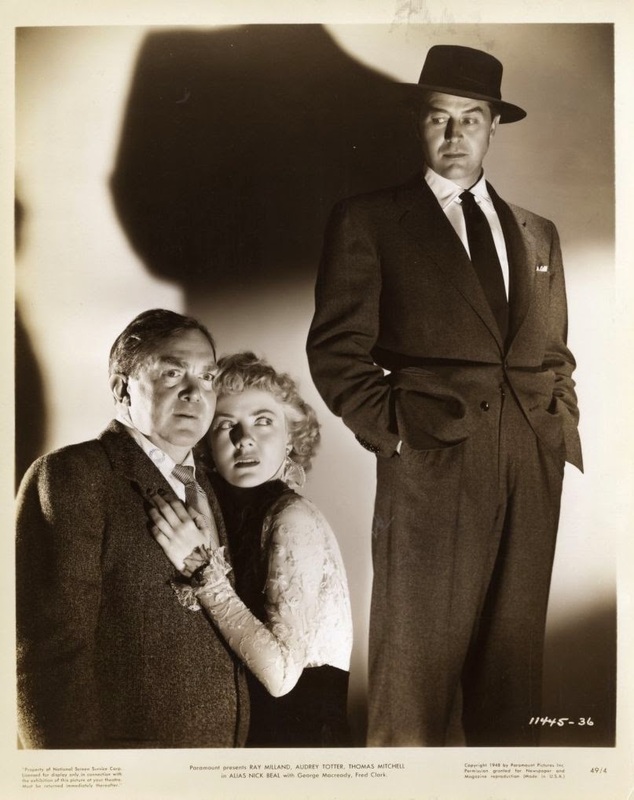 It stars Robert Young, Ruth Hussey, and Lee Bowman. ...This month's Saturday morning "B" series is the "Mexican Spitfire" series starring Lupe Velez. It kicks off on April 5th with the first film in the series, MEXICAN SPITFIRE (1940). ...The evening of April 5th features a trio of baseball movies, including FIELD OF DREAMS (1989), ANGELS IN THE OUTFIELD (1951), and IT HAPPENS EVERY SPRING (1949). 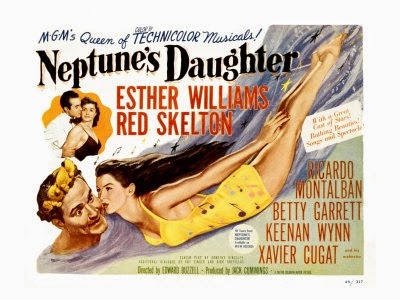 ...One of Esther Williams' very best movies, NEPTUNE'S DAUGHTER (1949), airs on April 6th. This is the movie which gave us the Oscar-winning "Baby, It's Cold Outside." ...Those who are enjoying the "Year of Ann Blyth" at Another Old Movie Blog may want to catch Ann in THE KING'S THIEF (1955) on April 8th. David Niven and George Sanders costar. ...A favorite "B" film, KID GLOVE KILLER (1942), airs on April 9th. It was directed by future Oscar winner Fred Zinnemann, starring Van Heflin and Marsha Hunt in a fun look at early "CSI" police criminology. ...I recently came across the documentary THE FIGHTING LADY (1944) online, narrated by Robert Taylor. A decade later a fiction film was released, MEN OF THE FIGHTING LADY (1954), starring Van Johnson, Walter Pidgeon, and Frank Lovejoy. It airs on April 9th. 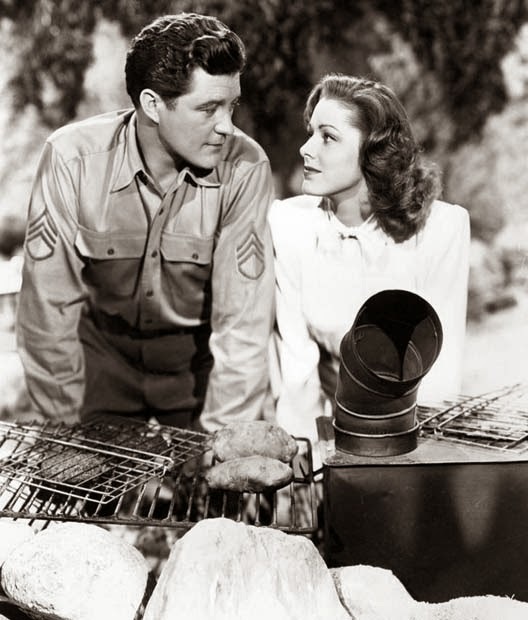 ...Also on the 9th: a favorite WWII romance, THE VERY THOUGHT OF YOU (1944) starring Dennis Morgan and Eleanor Parker. ...The 9th is simply a great day on TCM! I'm also quite interested in the obscure WWII film WENT THE DAY WELL? (1942) which airs that evening. ...Robert Montgomery is a wounded gangster on the lam who falls for a farmer's daughter (Maureen O'Sullivan) in the charming HIDE-OUT (1934). The last couple of scenes are some of my all-time favorite Robert Montgomery moments on film. It airs April 10th. ...Joan Blondell and Chester Morris star in the excellent pre-Code BLONDIE JOHNSON (1933) on April 11th. ...I'm hoping to revisit SUNDAY IN NEW YORK (1963) at the TCM Classic Film Festival. For those who can't make it to the festival, this fun and colorful '60s romantic comedy, starring the always charming Rod Taylor, airs on April 11th. ...There's a 60-minute special on April 14th called TCM: TWENTY CLASSIC MOMENTS which is described as "A look at some unforgettable moments in the twenty-year history of Turner Classic Movies." ...I'm excited about a Robert Montgomery film I've never seen which airs on April 16th: WAR NURSE (1930), costarring Anita Page. ...Later on the 16th there's an evening of butler movies, including favorites such as IF YOU COULD ONLY COOK (1935), MY MAN GODFREY (1936), and MERRILY WE LIVE (1938). ...The MGM tribute on April 17th and 18th includes THE THIN MAN (1934), MUTINY ON THE BOUNTY (1935), NINOTCHKA (1939), MEET ME IN ST. LOUIS (1944), SINGIN' IN THE RAIN (1952), THE BAND WAGON (1953), and NORTH BY NORTHWEST (1959), and that's just for starters. Don't miss it! 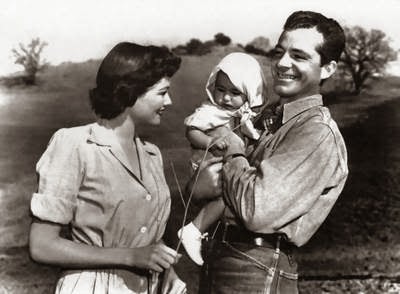 ...The evening of April 19th is devoted to films costarring the great screen team of Dana Andrews and Gene Tierney. It starts off with the classic LAURA (1944) and continues with WHERE THE SIDEWALK ENDS (1950). I'm delighted that for the first time TCM will be showing THE IRON CURTAIN (1948), with Andrews and Tierney in a fact-based story of a husband and wife who defected from the Soviet Union to Canada. ...On Easter Sunday, as always, TCM will be featuring the classic EASTER PARADE (1948) with Fred Astaire, Judy Garland, and Ann Miller. 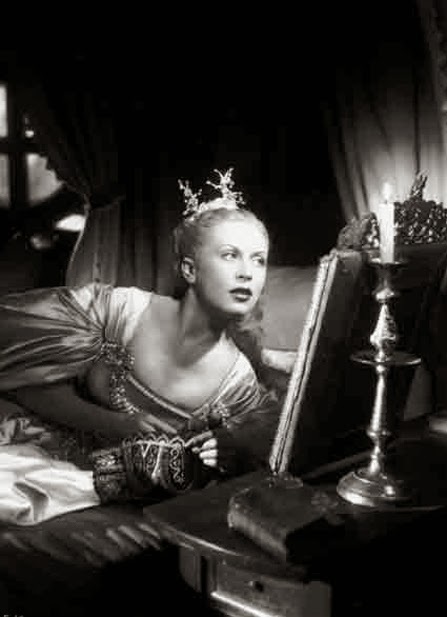 ...A wonderful night of fairy tales on April 26th features BEAUTY AND THE BEAST (1946) and THE GLASS SLIPPER (1955), plus Danny Kaye in HANS CHRISTIAN ANDERSEN (1952). ...The classic early Hitchcock film THE 39 STEPS (1935) airs on April 27th, starring Robert Donat and Madeleine Carroll. ...ANGEL FACE (1952) is a Robert Mitchum-Jean Simmons film I still need to see. Colin just wrote about it at Riding the High Country. The air date is April 28th. 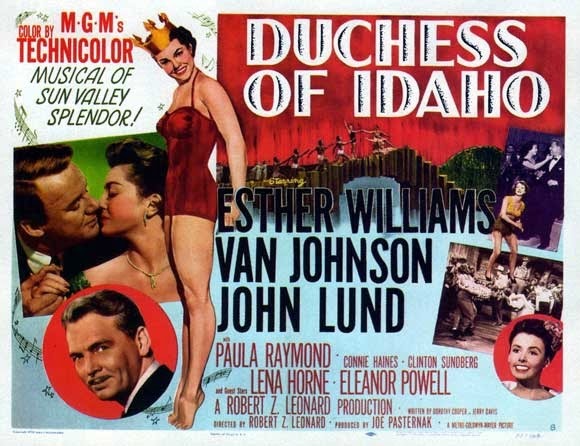 ...Another favorite Esther Williams film, DUCHESS OF IDAHO (1950), airs on April 30th. Pure eye candy! 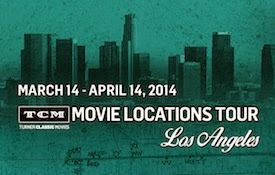 For more on TCM in April, please consult the full schedule. Congratulations to Turner Classic Movies on a wonderful first two decades, and here's to many, many more! What a great evening tonight at the Noir City Film Festival! I met up with my friend Lindsay and met her sister for the first time, and I also had the chance to meet Brian of Rupert Pupkin Speaks. It's always great to finally meet someone with whom you've corresponded! It was Audrey Totter night at the festival, and Audrey's daughter and granddaughter were in the house as we paid tribute to a much-loved actress and watched two of her films in 35mm prints. 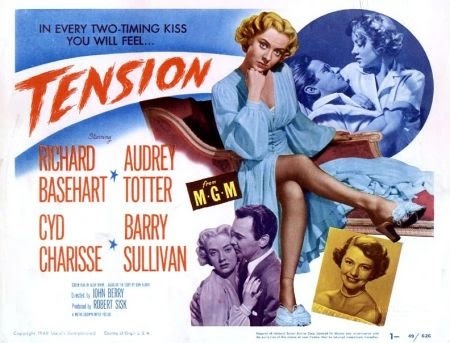 Tonight's double bill led off with TENSION (1949), which I last saw and reviewed five years ago. I couldn't believe it had been that long! I felt a sense of pure glee watching TENSION, which has deliciously fun performances by Totter, Barry Sullivan, and William Conrad, plus young Cyd Charisse at her loveliest. Although the audience ate up Audrey's every scheming moment, it was fun that it was Cyd -- telling off Sullivan and making clear she'll stand by her man -- who received applause as she walked out of the drugstore after her speech. A wonderful moment, not least because her reaction was so uncliched. TENSION is great fun, and I recommend the DVD to any noir fan who hasn't seen it yet. As for ALIAS NICK BEAL, it's amazing how creepy a nonviolent, non-gory film can be thanks to a good script, some fog, haunting music (by Franz Waxman), and terrific acting. 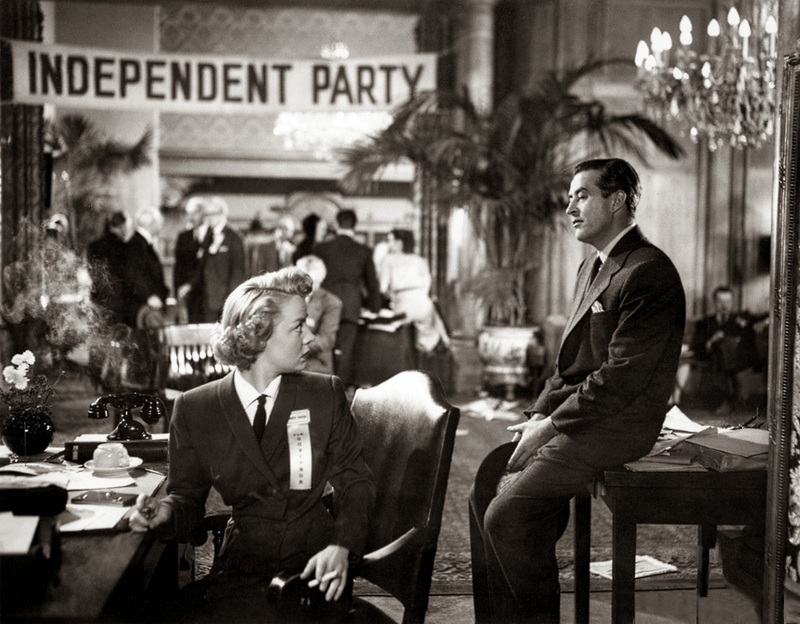 Ray Milland stars in the title role of this morality play about the temptation of a candidate for governor (Thomas Mitchell). As the film goes on, it becomes increasingly clear that Nick Beal is in league with the devil, if not the devil himself. When crusading district attorney Joe Foster (Mitchell) is recruited to run for governor, Nick Beal shows up to smooth his path. Yet the more Nick helps Joe, the more Nick demands in return, until Joe finds he's given up everything good for which he's stood. Milland is quite remarkable, mixing smooth-talking charm with steely-cold eyes which have a tendency to widen when he's angered. (At present, Nick Beal's beautifully designed entrance can be seen in a brief clip on YouTube.) Nick Beal's unexpected appearances become downright unnerving, for the audience as well as those he's stalking in the film, and the whistled tune which accompanies him is most effective. Milland is fascinating in that he could switch with ease from debonair leading man to playing the most evil characters imaginable. He was fearless in playing villains, not only here but in films such as SO EVIL MY LOVE (1948) and DIAL M FOR MURDER (1954). 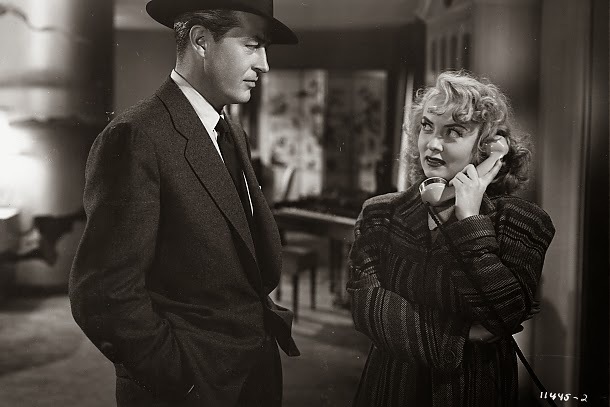 The film also has an outstanding performance by Audrey Totter as Donna, a down-and-out woman Beal finds in a waterfront dive. He offers her a life of luxury in return for her help corrupting Foster. Donna does a smooth job, but she gradually realizes just who she's dealing with and becomes completely terrified. It's a nicely developed, layered performance which is quite different from her out-and-out bad girl of TENSION. When I think of George Macready I think of the villains he's played, but here he plays a minister who may hold the key to freeing Joe from Nick's spell. The cast also includes Fred Clark, Henry O'Neill, Geraldine Wall, Darryl Hickman, King Donovan, Charles Evans, and Nestor Paiva. Bess Flowers fans should be on the lookout for her sitting in the front row when Mitchell's character delivers a speech. 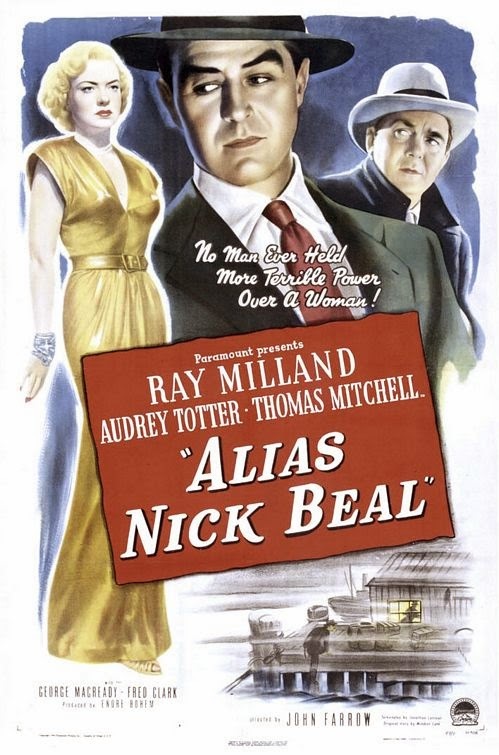 ALIAS NICK BEAL was directed by John Farrow, who also directed Milland in THE BIG CLOCK (1948). It was shot in black and white by Lionel Lindon. The script of this 93-minute film was by Jonathan Latimer, who wrote THE BIG CLOCK and also worked on the very atmospheric NIGHT HAS A THOUSAND EYES (1948) the year before. It's a well-constructed story which reaches a logical conclusion. My main quibble is a minor thing, in that it's said more than once that Joe is 48, and Thomas Mitchell was...not 48. There's a good review of this film by Steve at Mystery File. This film is not on DVD or even VHS, more's the pity. It's yet another Paramount film which needs to be freed by Universal for new audiences to enjoy. Update: Here's Lindsay's take on the film at Lindsay's Movie Musings. ...is taking this weekend off due to another busy weekend of movies in L.A.! Tonight I headed back to Hollywood for an tribute to the late, great Audrey Totter featuring TENSION (1949) and ALIAS NICK BEAL (1949). For those who might have missed last week's roundup, it can be found here! Tonight was "Los Angeles Noir" night at the Noir City Film Festival, featuring a pair of "B" movies filmed around the city. 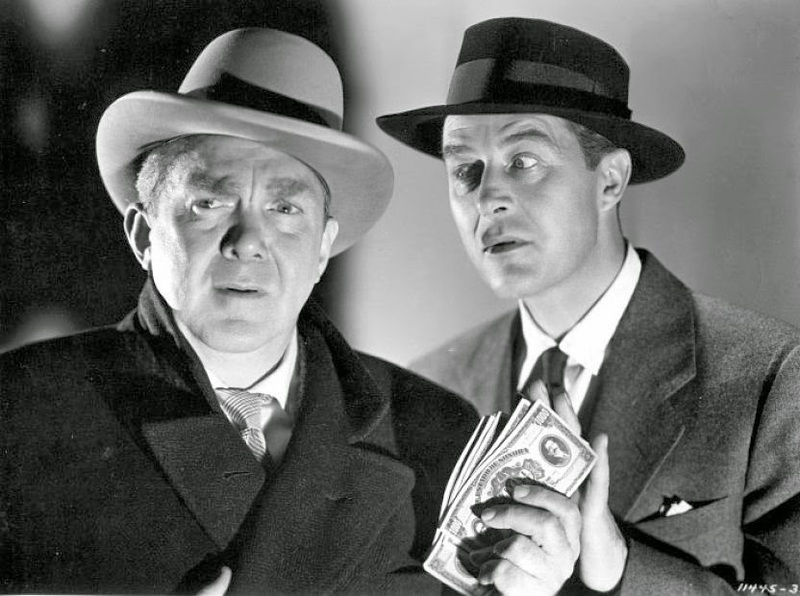 The double bill kicked off with a brand-new 35mm print of SOUTHSIDE 1-1000 (1950), a very enjoyable Allied Artists release with Don DeFore as a Secret Service agent working to break up a counterfeit ring. I reviewed the Warner Archive DVD in 2012 and enjoyed it all over again tonight. There are some great shots of L.A.; one of my favorite moments is when Don DeFore hops on the Angels Flight Railway. 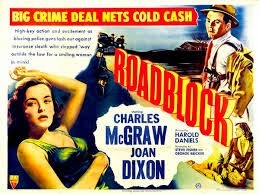 The second film of the night was ROADBLOCK (1951) starring noir icon Charles McGraw. 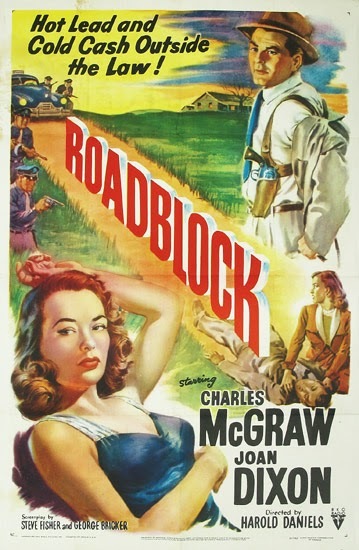 ROADBLOCK was an RKO film which fell in between McGraw's starring roles in ARMORED CAR ROBBERY (1950) and THE NARROW MARGIN (1952). 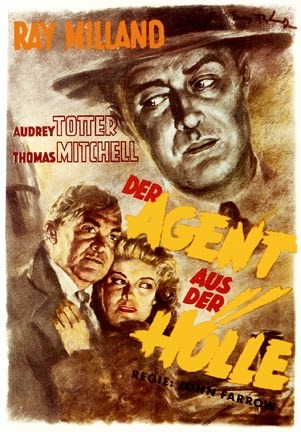 Whereas McGraw was a cop in each of that pair of films, in ROADBLOCK he plays Joe Peters, an insurance investigator whose partner is Harry Miller (Louis Jean Heydt). Joe meets avaricious Diane (Joan Dixon) on a flight to L.A. and is simultaneously annoyed and smitten. Soon he is completely head over heels for the dame, but she wants to hold out for someone who can offer her diamonds and furs. One of the best things about this fast-paced 73-minute movie is its L.A. atmosphere, especially the amazing final chase scene which takes place in a dry L.A. flood control riverbed -- an utterly fantastic location for an action-packed noir conclusion. I really enjoyed this film, although I wished that McGraw weren't playing, as Alan K. Rode described before the film, a "noir chump." McGraw's Joe seems too smart to be so dumb, although McGraw does do a good job conveying Joe's insecurity about being able to maintain Diane's interest long-term. I love McGraw as a heartsick romantic lead so that aspect of his performance was quite appealing to me. There was something quite adorable about tough guy McGraw wanting to surprise his lady love with a Christmas tree. This was one of just a handful of films starring actress Joan Dixon. She also appeared in BUNCO SQUAD (1950), EXPERIMENT ALCATRAZ (1950), and five Tim Holt Westerns, including the recently reviewed LAW OF THE BADLANDS (1951). 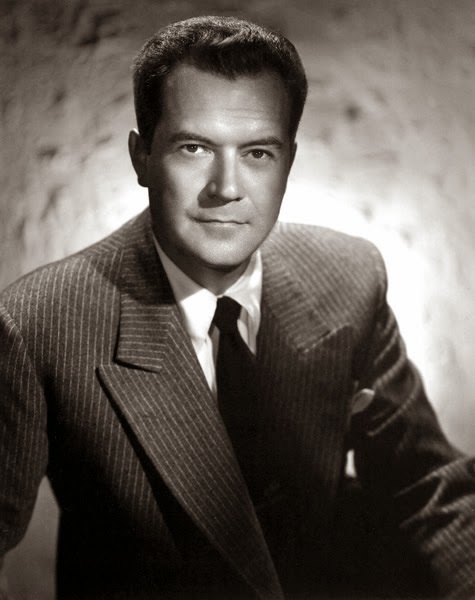 Louis Jean Heydt was an excellent actor with a long career; he reminds me a bit of James Millican, who would have been good alternate casting for the role of Harry. I have particularly enjoyed Heydt in a small but effective role as a trainer in THIRTY SECONDS OVER TOKYO (1944). 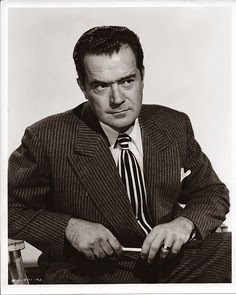 Milburn Stone of GUNSMOKE plays Joe and Harry's boss. Martha Mears, who dubbed many actresses over the years, is a nightclub singer. Lowell Gilmore, Harry Lauter, Dave Willock, and Harold Landon are also in the cast. 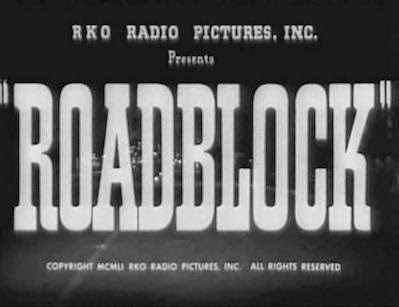 ROADBLOCK was directed by Harold Daniels and shot in black and white by Nicholas Musuraca. 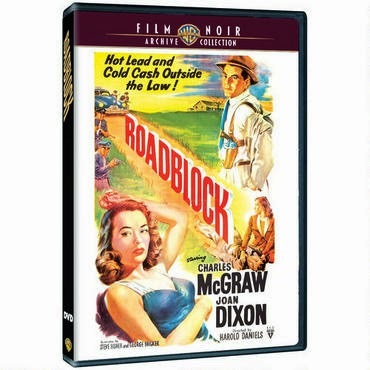 ROADBLOCK is available on DVD from the Warner Archive. To read more on this film, it was recently reviewed by Stacia at She Blogged By Night and Glenn Erickson at DVD Savant. The evening at the Egyptian started off with a seven-minute short, GLASS SUN (2013), in which a mystical shadow leads an investigator on a gorgeous tour of many iconic Los Angeles film noir locations, including the Bradbury Building, Union Station, the 2nd Street Tunnel, Chinatown, and Angels Flight Railway. GLASS SUN may currently be viewed online. On a recent visit to Disneyland I spent time taking in the latest exhibit in the Disney Gallery, Mechanical Kingdoms. The exhibit's subtitle is "Steam-Driven Visions of a Victorian Future," and it features some of Disney's many "retro-futuristic" designs. The exhibit particularly emphasizes designs for Disneyland Paris, which has Discoveryland rather than Tomorrowland; Discoveryland's concept is that visitors experience what "visionaries" of the 19th century dreamed of the future. There's a heavy Jules Verne theme including a walk-through of the Nautilus from 20,000 LEAGUES UNDER THE SEA. Some of my 2009 photos of Discoveryland can be seen in this post. The Disneyland Paris Space Mountain is much more intense than the Disneyland version, incidentally! I'm pretty sure I was upside-down at one point, but it was dark (grin). One of the Disneyland attractions which fascinated me most when I was young was Monsanto's Adventure Through Inner Space. I think I was pretty convinced at one point that people really shrunk entering the ride! There are many additional photographs of the exhibit at MiceChat and Disneyland Live. Previous Disney Gallery exhibits: Magic on the Water, The Colors of Mary Blair, Trains of Disney, Crowning Achievements, and Tiki, Tiki, Tiki Realms. Actor Frank Lovejoy was born in the Bronx on this date 102 years ago, on March 28, 1912. Prior to three or four years ago, I'm not sure I could have picked out Frank Lovejoy's photo, as up to that point he was someone whose work simply hadn't come up much in my viewing. In recent years he's become a real favorite, the kind of actor whose name causes me to smile when it turns up in the opening credits. Lovejoy started out working on Broadway and in radio. Jake Hinson wrote about Lovejoy's radio career last year for the Noir City e-magazine, and has also posted the article at The Night Editor. One of my goals is to catch up with Lovejoy's radio show NIGHT BEAT, which you can read all about here and listen to an episode here. Lovejoy's film career began in 1948, and by his third film he was costarring with Humphrey Bogart and Gloria Grahame in IN A LONELY PLACE (1950). I love the way his wife in the film, played by Jeff Donnell, describes him as "attractive and average." That "Joe Everyman" quality was part of Lovejoy's appeal, yet there was a compelling edge to his performances which made him stand out. Lovejoy was quite a fine actor, as anyone who's seen him in another early film, TRY AND GET ME (1950), can attest. He makes it completely believable that his "regular guy" character is led along by psychotic criminal Lloyd Bridges into the very worst possible behavior, yet his tormented anguish is such that he continues to draw viewer sympathy. Since the film was beautifully restored a few years ago, hopefully even more people will have the chance to admire his superb performance in a disturbing film. On a lighter note, SHACK OUT ON 101 (1955), released on DVD last year by Olive Films, is pure fun, with Lovejoy playing a mild-mannered professor who's actually working to ferret out Commies in a shabby roadside diner. Frank Lovejoy was just 50 years old when he passed on from a heart attack in 1962. He was survived by his wife, actress Joan Banks, and two children. I regret the many performances we were never able to experience due to his early passing, but he left behind a wonderful body of work which continues to entertain film viewers -- and radio listeners! -- today. For more information on Frank Lovejoy, please visit the birthday tribute posted by Ivan last year at Radio Spirits. 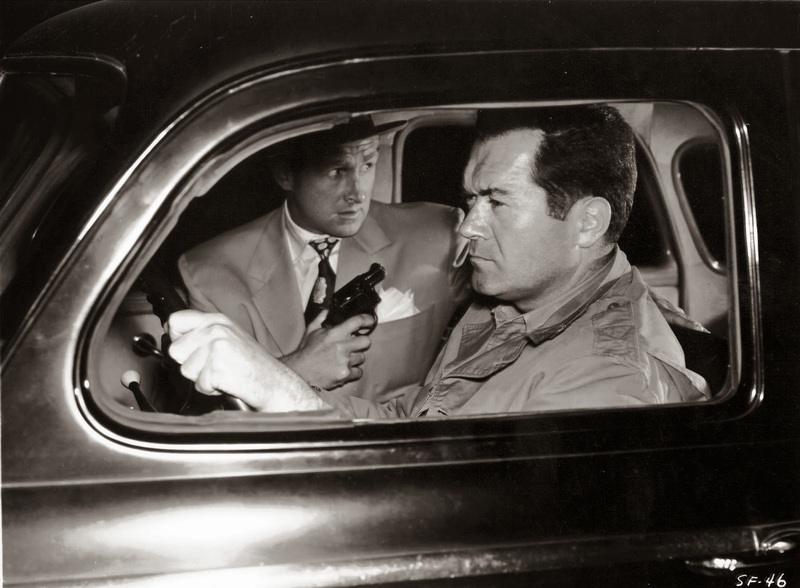 I'm very much looking forward to seeing Frank Lovejoy starring with Edmond O'Brien and William Talman in Ida Lupino's THE HITCH-HIKER (1953) on the closing night of this year's Noir City Film Festival. He was in many more good films, and review links for some of them are below. I'd encourage anyone who -- like me just a few years ago -- isn't familiar with Lovejoy's work to seek out some of his films. 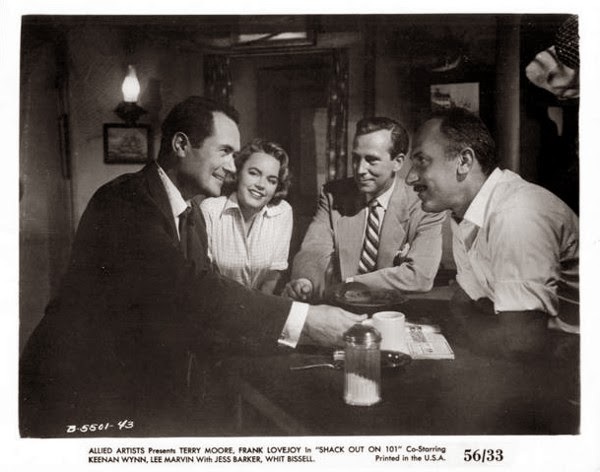 Previously reviewed Frank Lovejoy films: IN A LONELY PLACE (1950), TRY AND GET ME (1950) (also here), GOODBYE, MY FANCY (1951), BEACHHEAD (1954), STRATEGIC AIR COMMAND (1955), TOP OF THE WORLD (1955), THE CROOKED WEB (1955), SHACK OUT ON 101 (1955), THREE BRAVE MEN (1956), and JULIE (1956). 2015 Update: Here are reviews of additional Frank Lovejoy films reviewed in the past year: BLACK BART (1948), FORCE OF ARMS (1951), THE HITCH-HIKER (1953), SHE'S BACK ON BROADWAY (1953), and MEN OF THE FIGHTING LADY (1954). 2016 Update: Here's a review of STRATEGIC AIR COMMAND (1955). Additionally, I visited Frank Lovejoy's burial site at Holy Cross Cemetery. I'm rather amazed that, after having seen just three "new" films in all of 2013, tonight I saw my seventh new film of 2014 -- and we're still in the first quarter of the year! Not only that, but three of the films have starred Kevin Costner, who is back in movies in a big way this year, and that's a great thing. Costner's latest, DRAFT DAY (2014), opens on April 11th, but I was able to see a preview screening tonight thanks to a kind friend who knows I like Costner and invited me to be her guest. I found DRAFT DAY highly enjoyable. 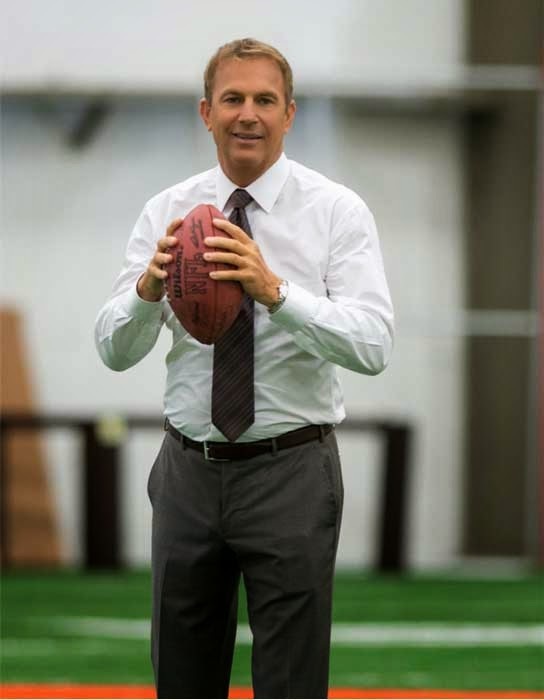 Costner plays Sonny Weaver Jr., the GM of the Cleveland Browns, a man living in the shadow of his very recently deceased father. As a matter of fact, Sonny Jr. had once infamously fired his father, a coach, and now he's struggling to put together his own vision of the team, all while the team owner (Frank Langella) is breathing down his neck and expecting Sonny to deliver big time on draft day. DRAFT DAY was what MONEYBALL (2011) should have been, with the focus on wheeling and dealing. DRAFT DAY avoids the "Brad Pitt driving around in a car thinking" syndrome by setting the entire film, other than an epilogue, on a single day and keeping the story moving, not allowing more than brief shots of Costner staring into space pondering his next move. The film tells its story with a modern, energetic visual style, using lots of split screens and onscreen graphics as Sonny negotiates his way through the day. I especially liked the way the film clearly established who Sonny was speaking with prior to each phone call, showing that team's stadium. The movie does get formulaic, with Sonny and his girlfriend (Jennifer Garner), a team exec, having a major turning point in their relationship on that very day, meanwhile his mother (Ellyn Burstyn) is having her own crisis of sorts. (You'd think a woman who had lived her entire life with football wouldn't try to pull Sonny aside for something important just a couple of hours before the draft starts!) That said, it's a good formula, briskly told, and vastly more interesting than the personal story which made MONEYBALL so sluggish. 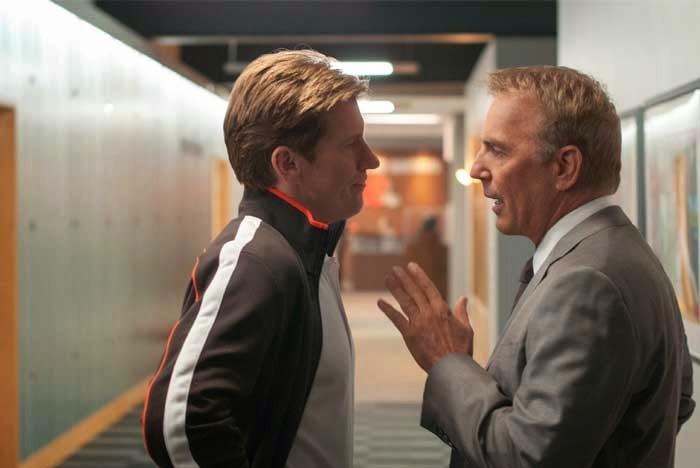 Whereas MONEYBALL was plodding, DRAFT DAY flies by so quickly I was almost surprised when it was over, and I would have enjoyed spending even more time with the characters. One of the things I liked about Costner's character was that despite all the pressure, for the most part -- other than an unfortunate run-in with an intern's laptop -- he has a professional demeanor, whether it's wearing a suit when many around him don't bother, or the polite way he quizzes potential draft picks and their agents on the phone. He repeatedly says "Just let me do my job," and it's a job he clearly relishes despite its headaches. Dennis Leary registers well as the coach who clashes with Sonny over his last-minute decisions. As a Sam Elliott fan I was sorry Elliott only had one extended scene as a college coach, but he made it count. That's Costner's long-ago SILVERADO (1985) costar, Rosanna Arquette, playing his ex-wife in a brief scene. Tom Welling of SMALLVILLE plays the Browns quarterback battling back from injury, who's livid he might be replaced by star pick Bo Callahan (Josh Pence). 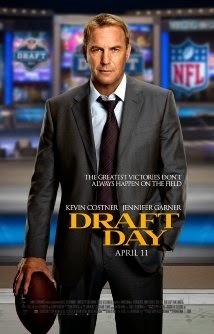 DRAFT DAY was directed by Ivan Reitman. The movie, shot by Eric Steelberg, has a very crisp, clean visual style. It will look great airing on TV in high definition, sandwiched in between some football games. Parental advisory: This film is rated PG-13 for strong language. For trailers and more, visit the movie's official website. The trailer can also be seen on IMDb. Additional "new" movies reviewed this year: JACK RYAN: SHADOW RECRUIT (2014), THE MONUMENTS MEN (2014), THE LEGO MOVIE (2014), THE WIND RISES (2013), NON-STOP (2014), and 3 DAYS TO KILL (2014). A few days ago I enjoyed the Turner Classic Movies Los Angeles Movie Locations Tour. 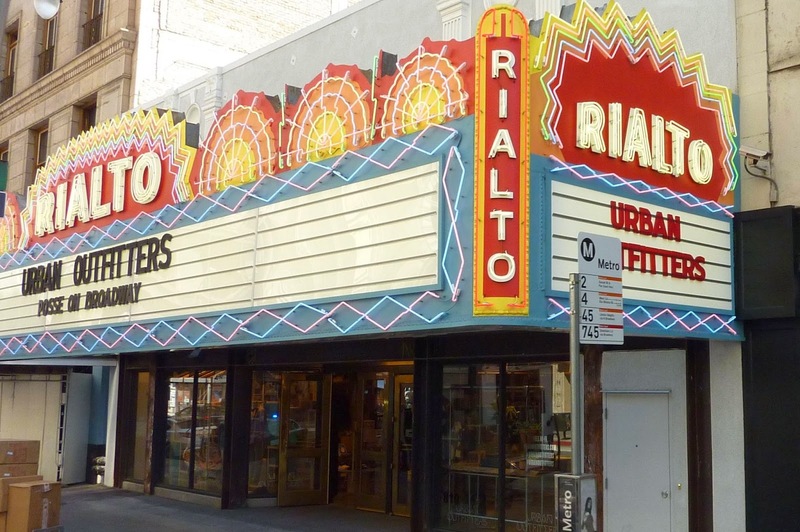 The tour covered multiple aspects of Los Angeles film history, driving past movie studios, film locations, and several of the city's oldest movie theaters, particularly the movie palaces of Downtown Los Angeles. Follow the links below to sites describing the very interesting history of these great old theaters. The Million Dollar Theater was opened by Sid Grauman in 1918. A couple of years ago I had the rare opportunity to see a double bill at the Million Dollar Theater, consisting of THE BIG COMBO (1955) and PITFALL (1948). The interior is incredibly ornate, and I wish it would be possible to restore it to its former glory, just as Disney has done with the 1926 El Capitan Theatre on Hollywood Boulevard. The Orpheum Theatre dates from 1926. 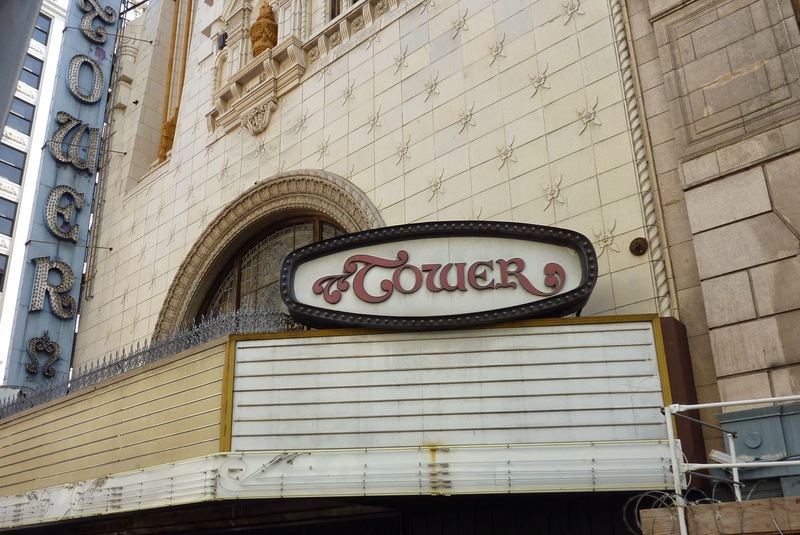 The Tower Theater, which opened in 1927, was the first in Los Angeles to have air conditioning. And here's a couple of theaters outside the Downtown area. 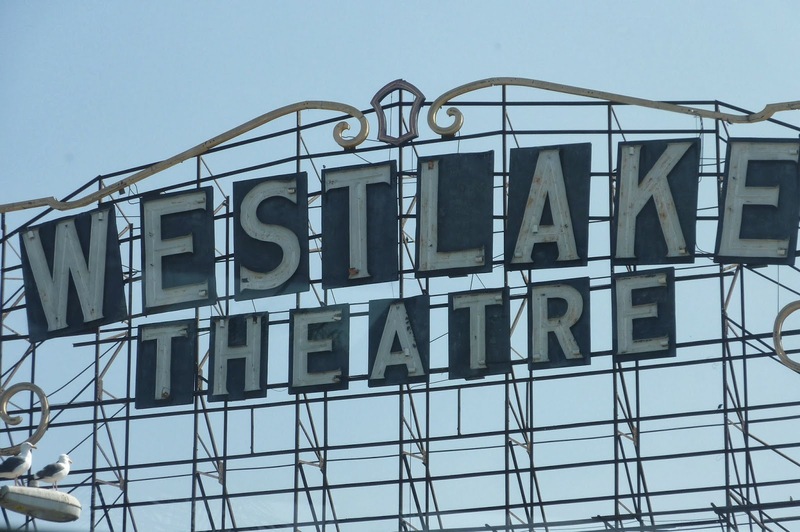 The Westlake Theatre opened in 1926. The Vista Theatre on Sunset originally opened under another name in 1923. Here's a couple more great links on the Vista and its history, with wonderful photos, at Cinema Sightlines and Los Angeles Theatres. The Los Angeles Conservancy will be hosting its 28th annual Last Remaining Seats film series this June, providing the opportunity to see classic titles such as FOOTLIGHT PARADE (1933), THE LADY EVE (1941), and CITIZEN KANE (1941) in some of the oldest theaters in the city, including the Orpheum and the Palace. THE GAMBLER FROM NATCHEZ is part Western, part swashbuckler, and 100% entertaining. It's the perfect movie to watch at the end of a long day -- undemanding yet well-made and enjoyable. Another blogger aptly called it "a merry 88 minutes of malarkey." The story plays out rather like one of the more dramatic episodes of my favorite TV series, MAVERICK, and that comes as no surprise once one realizes that co-screenwriter Gerald Drayson Adams would go on to write several strong episodes of that classic series, including one of my favorites, "The Savage Hills." The movie starts in fine fashion with opening credits music so stirring that my husband came in from the other room to see who'd composed it. The answer: Lionel Newman. 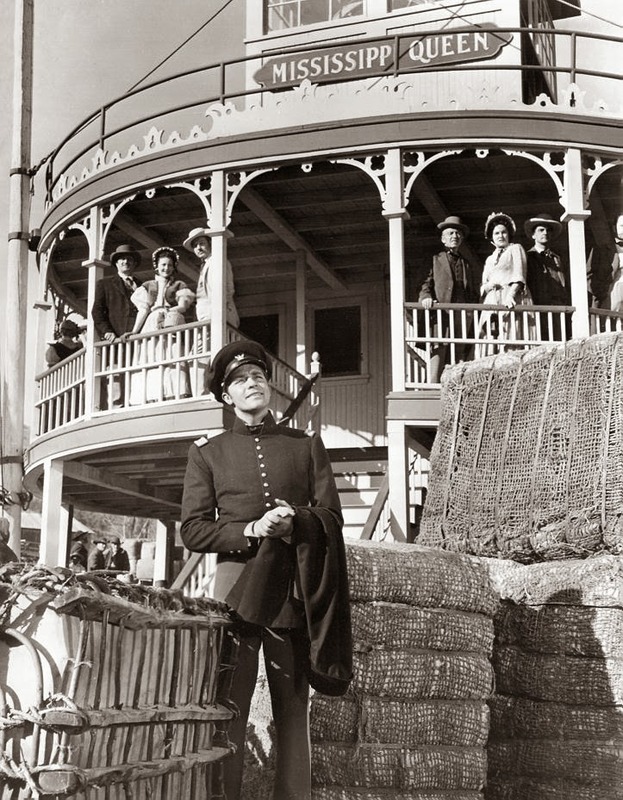 It's the 1840s, and Captain Vance Colby (Dale Robertson) returns home from military service only to discover his beloved father, a famed gambler, was murdered at a casino. 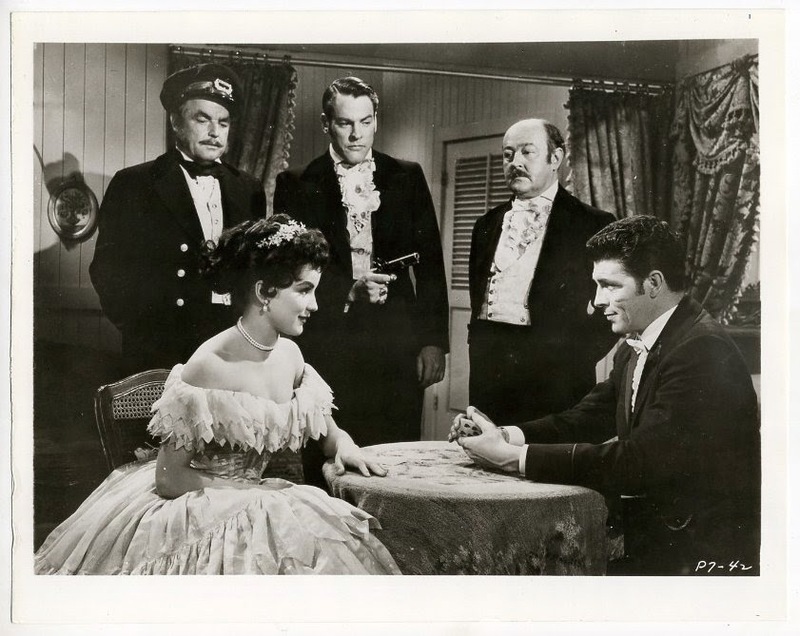 Vance makes it his mission to avenge his father's death and one by one tracks down the three men responsible, aided by a riverboat captain (Thomas Gomez, a past Oscar nominee for RIDE THE PINK HORSE) and his gorgeous daughter (Debra Paget). The MONTE CRISTO style story is pleasingly presented, with a well-paced script and colorful settings. (The Los Angeles Arboretum stands in for Mississippi.) Vance writes the names of the three men he seeks on a playing card and one by one tears the names off the card as he finds them. 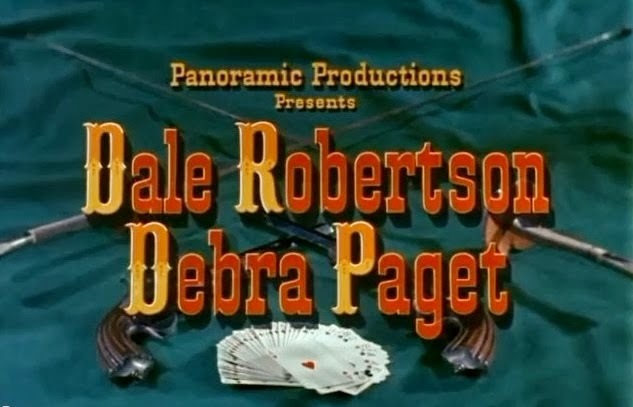 Debra Paget's many fans will enjoy her as the fiery bayou girl who wants Captain Colby and is determined to have him, rather than see him end up with the delicate blonde Ivette (Lisa Daniels, whose British accent sometimes peeks through). I wish that TCM would invite Paget to a future festival, as I would love to have her work honored and see her in person. Kevin McCarthy is the chief villain, a couple of years before he starred in INVASION OF THE BODY SNATCHERS (1956). Look for Woody Strode as one of those aiding Captain Colby; Juanita Moore (IMITATION OF LIFE) has a small role as Ivette's maid. 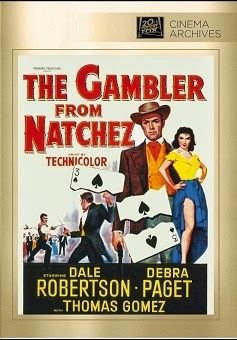 THE GAMBLER FROM NATCHEZ was a Panoramic Production, released by 20th-Century Fox. It was directed by Henry Levin and filmed in Technicolor by Lloyd Ahern. 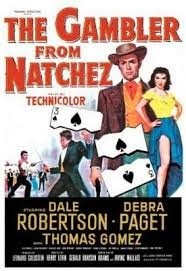 THE GAMBLER FROM NATCHEZ is available on DVD-R from the Fox Cinema Archives. Many widescreen-era FCA releases have aspect ratio issues, but I thought this film, which IMDb says was originally shown in a 1:66 ratio, looked just fine as a fullscreen DVD release, with nice crisp print. I thought the DVD looked better than a reviewer at Home Theater Forum so potential purchasers may want to read that review for an alternate take. This film can also be rented from ClassicFlix, and as I write this it's currently available on YouTube.